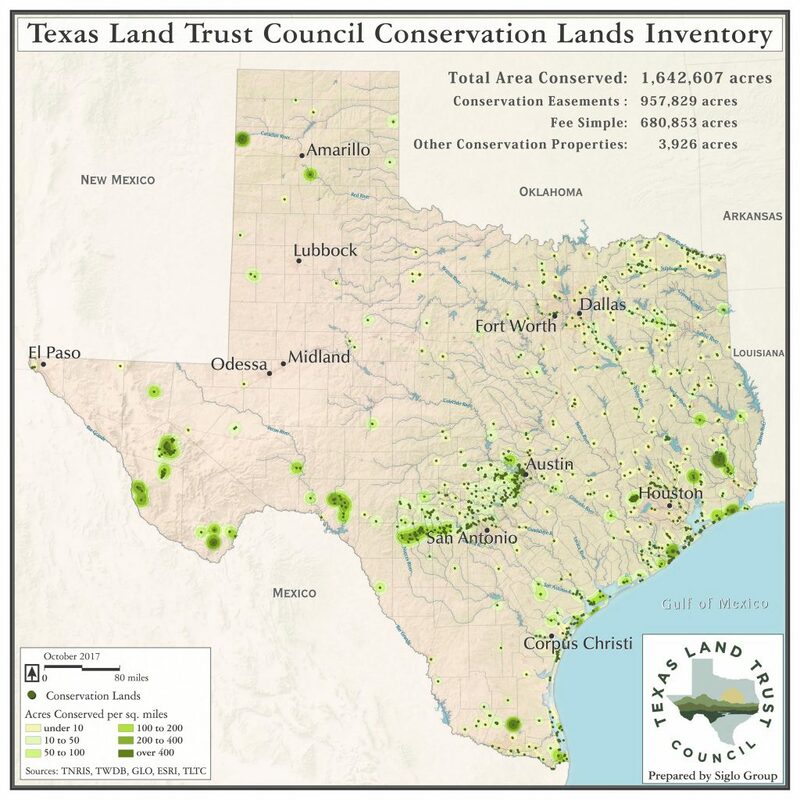 The Texas Land Trust Council (TLTC), through its Conservation Lands Inventory (CLI), is using the power of geographic information to better understand and communicate the success and economic benefits of conservation efforts throughout Texas. 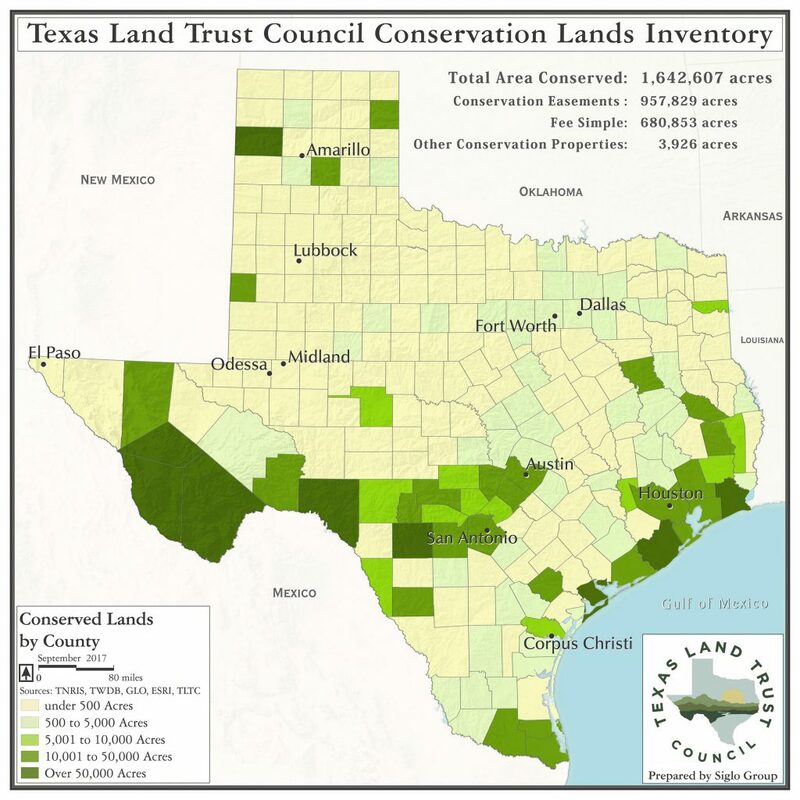 The Inventory provides data and visual information on all of the lands protected and conservation easements held by land trust organizations across the state. The geographic information systems (GIS) database and associated maps reveal how this work is collectively influencing the Texas landscape. 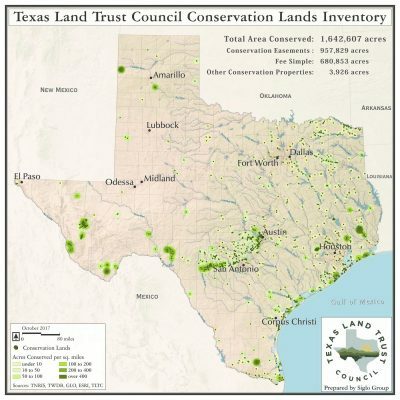 The CLI remains a unique resource for information on private land conservation found nowhere else in Texas. 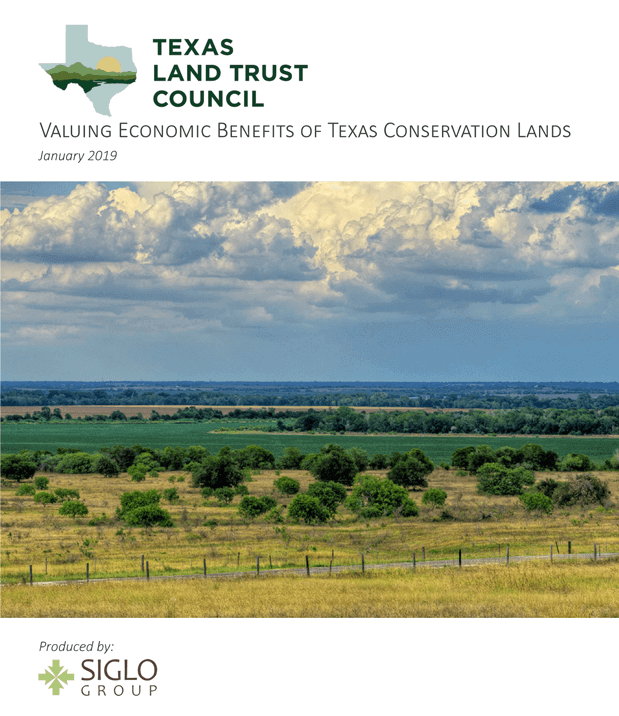 In 2019, TLTC released a report that evaluated some of the important, economic benefits provided by the lands that have been permanently conserved by Texas land trusts. Economic values for those benefits were calculated using an ecosystem services approach. Lands were evaluated for their impact on water quality and quantity, inland and coastal flood prevention, and rural economies (agricultural production and wildlife benefits). 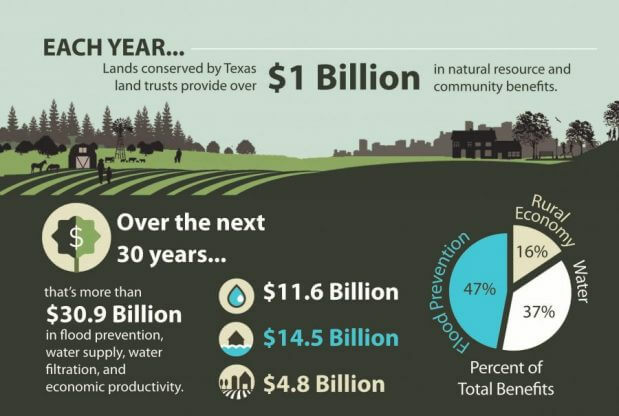 The analysis found more than $1 Billion in annual benefits to Texas taxpayers from the more than 1.65 Million acres of land protected and held by Texas land trusts. This monetary valuation of the benefits that conserved lands provide allows us to more clearly articulate the worth and cost-effectiveness of land conservation to decision makers. The findings represent a great step forward toward recognizing the substantial value that these lands bring to the Texas economy. The Conservation Lands Inventory seeks to geographically and visually reflect the substantial and combined impact of the ranches, wildlife habitats, farms, forests, and watersheds protected by Texas land trusts. 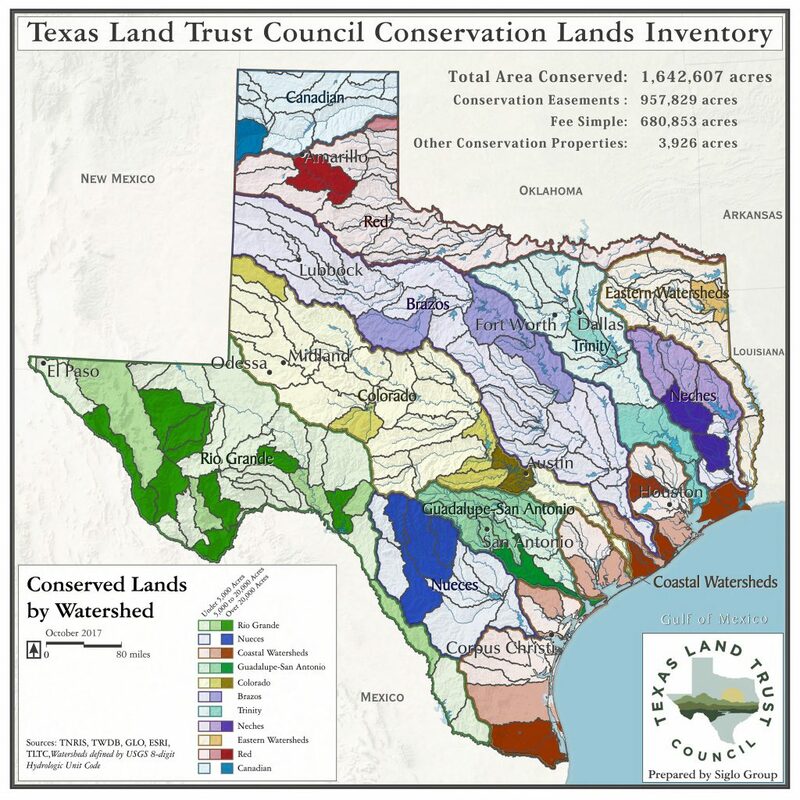 This data and associated analyses continue to be instrumental in improving conservation planning, and in developing tools and information to educate the public about the many benefits of land and water conservation. Click any of the maps below to view a larger map image of our conserved lands data across the state, by county, eco-region, or watershed. The Conservation Lands Inventory provides current data and visual information on all of the lands protected and conservation easements held by land trust organizations across the state. 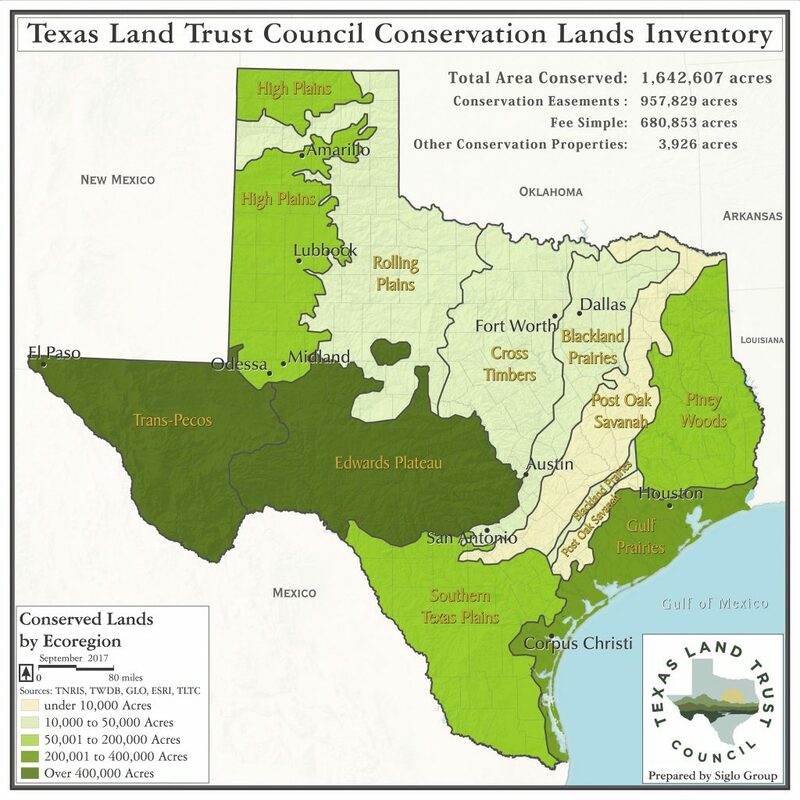 The goal is to utilize this information to benefit the entire land trust community, ensure high quality geographic data, provide statistics for public outreach and education, and help the land trust community to better use technology for more effective conservation. The Inventory serves as a central repository for that information and is evolving to meet current and future needs. Move over the images below to get detailed information on conservation land distribution across the Texas eco-regions, as well as to see the historical trend of how lands have been conserved in Texas across time.